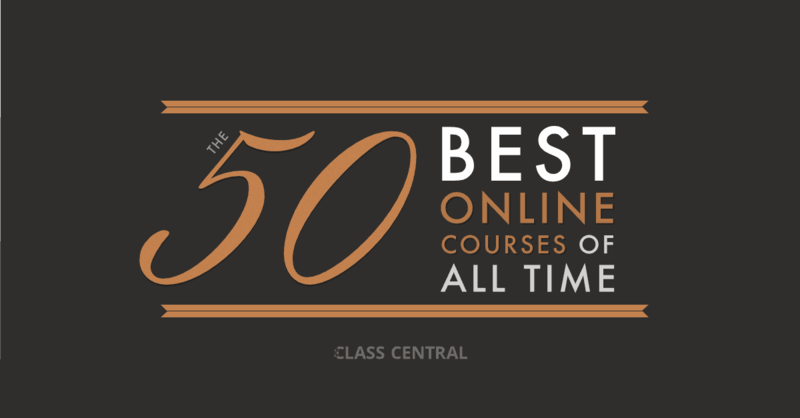 We are back with an updated list of the best free online courses and MOOCs of all time. Class Central published the Top 50 MOOCs for the first time in July of 2016 and refreshed it again last year. Between each iteration of this list, universities and MOOC providers have added a couple thousand new courses and Class Central users have written just as many new reviews. 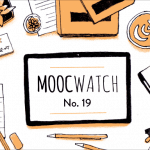 Now there are over 10,000+ MOOCs from over 800 universities worldwide. This can be daunting to the millions of learners around the world who have never done an online course before. That’s why we came up with a list of Top 50 MOOCs of All Time based on thousands of reviews written by Class Central users. In providing a small but well-reviewed list of courses, our hope is that new learners will not be overwhelmed when entering the MOOC space. Reviews will help new learners figure out if a course is right for them, and whether they will have a great first experience. If you know someone who has never taken an online course, send them here. Share this page with your network on your favorite social media site to help your friends and contacts enrich their lives. The Top 50 MOOCs will be updated regularly as new courses are added and we receive new reviews. Better yet, you can also Follow the Top 50 MOOCs on its special collection page (look for the “follow top 50” button just below the title). Followers will receive a notification whenever we update the Top 50 MOOCs list. The Top 50 MOOCs collection page. Use the Follow button to be notified when the list gets updated. Oh … and if you feel that a course you took deserved to be on this list but isn’t, please find the course on Class Central and write a review for the course. The methodology we used for this list is simple. Using thousands of reviews written by our users, Class Central was able to sort these courses by the Bayesian average of their ratings. Then we removed all the courses with less than 35 reviews (the low threshold helps smaller providers to compete on quality) and courses for which we had doubts whether they would be offered again. If a course has multiple parts, we only included the first part in the Top 50. Note: A few of the Coursera courses in the list have a paywall for graded assignments. You can read more about it here. There are a lot of usual suspects in the Top 50. Think of courses like Learning How To Learn, Harvard’s CS50x, ModPo, and Class Central’s best online course of 2016 — Coding in your Classroom, Now! as well as Class Central’s best online course of 2017, Mindshift: Break Through Obstacles to Learning and Discover Your Hidden Potential. Presentation skills: Designing Presentation Slides from Tomsk State University on Coursera. This is the first Russian university to make into Class Central’s Top 50. 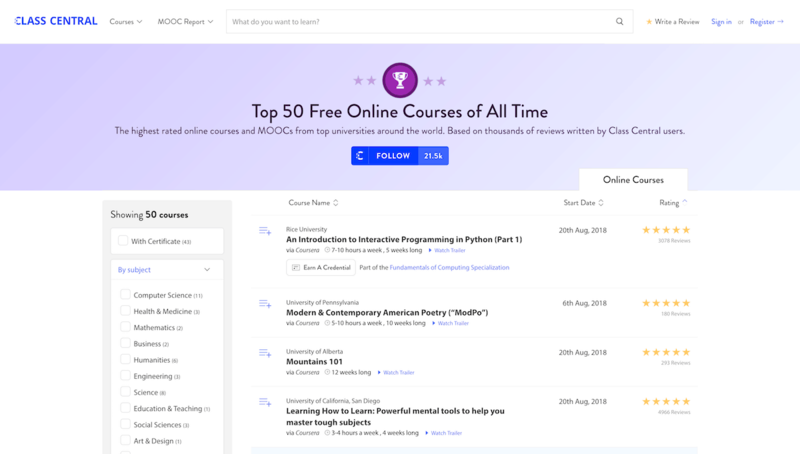 The Top 50 also contains courses from prominent personalities, like The Science of the Solar System by Mike Brown (AKA “Plutokiller”) and Functional Programming Principles in Scala by Martin Odersky (the creator of Scala). Stanford, Penn, and University of Cape Town each have three courses in the Top 50. Barbara Oakley and Terry Sejnowski, the instructors of the most popular MOOC in the world, have two courses in the top 50. 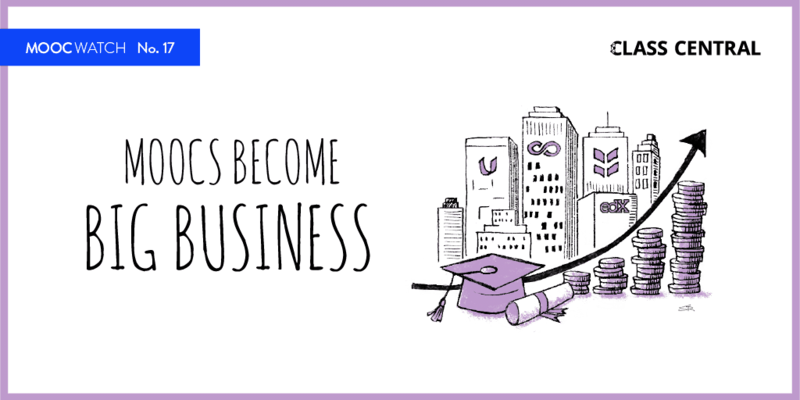 Their new course Mindshift joins Learning How To Learn in the top 50. If you want to see all courses sorted by their ratings, visit the Top 50 collection page. Alternatively, you can browse the courses below. This course is designed to help students with very little or no computing background learn the basics of building simple interactive applications. This course aims to teach everyone the basics of programming computers using Python. We cover the basics of how one constructs a program from a series of simple instructions in Python. The course has no pre-requisites and avoids all but the simplest mathematics. This course provides a broad introduction to machine learning, datamining, and statistical pattern recognition. This course teaches computer programming to those with little to no previous experience. It uses the programming system and language called MATLAB to do so because it is easy to learn, versatile and very useful for engineers and other professionals. A new and updated introduction to computer science as a tool to solve real-world analytical problems using Python 3.5. Through inspiring examples and stories, discover the power of data and use analytics to provide an edge to your career and your life. This is CS50x, Harvard University’s introduction to the intellectual enterprises of computer science and the art of programming for majors and non-majors alike, with or without prior programming experience. In this course, students will learn fundamental machine learning techniques that can be used to make sense of human gesture, musical audio, and other real-time data. The focus will be on learning about algorithms, software tools, and best practices that can be immediately employed in creating new real-time systems in the arts. In this course you will discover the elements of the functional programming style and learn how to apply them usefully in your daily programming tasks. Algorithms are the heart of computer science, and the subject has countless practical applications as well as intellectual depth. This course is an introduction to algorithms for learners with at least a little programming experience. This course covers the essential information that every serious programmer needs to know about algorithms and data structures, with emphasis on applications and scientific performance analysis of Java implementations. This course will teach you the mechanisms of gamification, why it has such tremendous potential, and how to use it effectively. 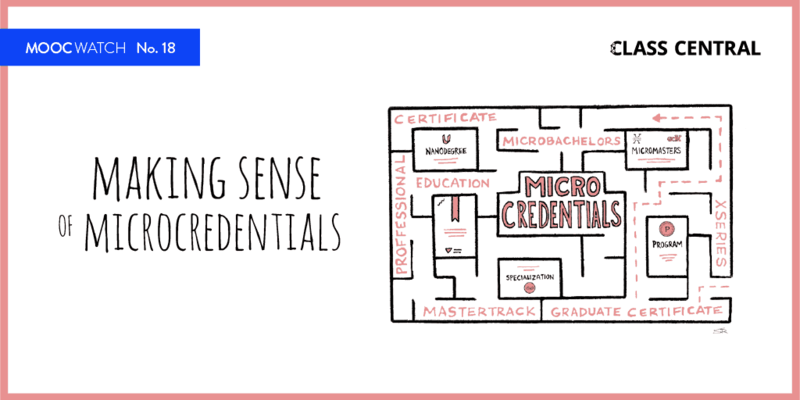 In this course you will learn the inner workings of cryptographic systems and how to correctly use them in real-world applications. This course introduces you to deep learning: the state-of-the-art approach to building artificial intelligence algorithms. We cover the basic components of deep learning, what it means, how it works, and develop code necessary to build various algorithms such as deep convolutional networks, variational autoencoders, generative adversarial networks, and recurrent neural networks. Questo corso è ambizioso e semplicissimo. Ha l’obiettivo di aiutarti ad introdurre il pensiero computazionale in classe attraverso il coding, usando solo attività intuitive e divertenti da proporre direttamente agli alunni. This course, based on the award-winning class offered both at the Indian School of Business and at the McCombs School of Business at The University of Texas at Austin, developed by Prof. Raj Raghunathan (aka “Dr. Happy-smarts”) draws content from a variety of fields, including psychology, neuroscience, and behavioral decision theory to offer a tested and practical recipe for leading a life of happiness and fulfillment. Are you planning to visit, or work or study in the Netherlands soon? This free online course is perfect if you have little or no prior knowledge of Dutch, but would like to master the fundamentals in order to survive life in the Low Countries. The course, which is designed for English speakers, offers a variety of exercises after going through the stages of content presentation, comprehension and production. This introductory Chinese language course will emphasize basic language skills for everyday life in Mandarin speaking countries. In this introductory course, you will learn how Shakespeare uses emotion in his plays, how his characters experience and manipulate emotions, and how the emotional resonance of the plays makes them powerfully relevant to the modern world. Mountains 101­­ is a broad and integrated overview of the mountain world. This 12-lesson course covers an interdisciplinary field of study focusing on the physical, biological, and human dimensions of mountain places in Alberta, Canada, and around the world. This free online course will bring together learners and practitioners interested in how the mind works. It aims to build bridges between traditionally antagonistic approaches to understanding the mind. This course is an introduction to learning and applying the principles required to solve engineering mechanics problems. Concepts will be applied in this course from previous courses you have taken in basic math and physics. The course addresses the modeling and analysis of static equilibrium problems with an emphasis on real world engineering applications and problem solving. In this course you’ll gain an introduction to the modern study of dynamical systems, the interdisciplinary field of applied mathematics that studies systems that change over time. Topics to be covered include: phase space, bifurcations, chaos, the butterfly effect, strange attractors, and pattern formation. We live in a complex world with diverse people, firms, and governments whose behaviors aggregate to produce novel, unexpected phenomena. We see political uprisings, market crashes, and a never ending array of social trends. How do we make sense of it? Models. Learn how to think better, argue better, and choose better. Learn about the science behind the current exploration of the solar system. Use principles from physics, chemistry, biology, and geology to understand the latest from Mars, comprehend the outer solar system, ponder planets outside our solar system, and search for habitability in our neighborhood and beyond. In this course, we learn how EU policy is made, and how policy is transferred to member states and implemented by various authorities, including regional and local governments. This online course is designed to include all of the core concepts in neurophysiology and clinical neuroanatomy that would be presented in most first-year neuroscience courses in schools of medicine. This course gives you easy access to the invaluable learning techniques used by experts in art, music, literature, math, science, sports, and many other disciplines. We’ll learn about the how the brain uses two very different learning modes and how it encapsulates (“chunks”) information. This course examines how digital tools, such as the Internet, smartphones, and 3D printing, are revolutionizing the world of marketing by shifting the balance of power from firms to consumers. ¿Quieres conocer tus recursos y niveles de desempeño relacionadas con tu proceso de aprender? ¿Te interesa desarrollar habilidades para aprender más y mejor? Interest in mindfulness has grown enormously over the last few years. It’s no surprise: mindfulness techniques can improve your communication skills, relationships and emotional health. But not everyone knows how to apply mindfulness in daily life. 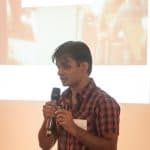 The goal of this course is to change that by equipping learners with a set of tools to create simple, clear and aesthetic slides which improve the presentation of the speaker. The course covers universal design principles, templates, colors, typefaces, slides’ typography, use of photos and pictograms, composition rules and ways to create clear and meaningful charts and diagrams. This is a course about dementia looking at a broad range of topics including, basic brain anatomy, pathology, dementia research, risk factors, symptoms, diagnosis, medical management, living with dementia, progression and staging, palliation, behaviours and therapeutic approaches. With the ageing of the world’s population, dementia is looming as the public health issue of the 21st Century. Is it possible to modify your risk of dementia? A substantial proportion of risk is associated with advanced ageing as well as genetic risk factors, but the latest research has indicated there are modifiable risk factors which may decrease your susceptibility to dementia. The Preventing Dementia MOOC investigates the best available evidence about dementia prevention, drawing on a range of global experts. If you are simply interested in properly understanding the published literature or if you are embarking on conducting your own research, this course is your first step. It offers an easy entry into interpreting common statistical concepts without getting into nitty-gritty mathematical formulae. To be able to interpret and understand these concepts is the best way to start your journey into the world of clinical literature. Learn mindfulness techniques to reduce stress and improve your wellbeing and work/study performance. The vital signs – heart rate, blood pressure, body temperature, respiration rate, and pain – communicate important information about the physiological status of the human body. In this six-part course we explore the anatomy and physiology underlying the vital signs so that you will develop a systematic, integrated understanding of how the body functions.